Photo:End of the World, Again. We saw the “end of the world” several times on our trip according to various guidebooks. 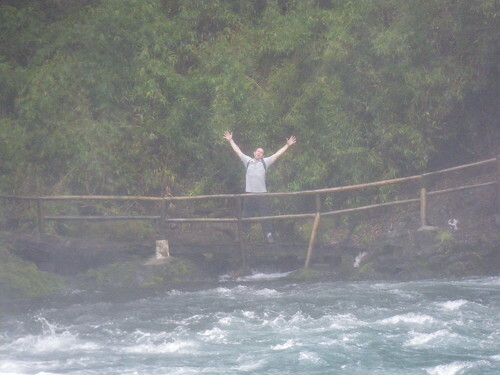 This one happened to be in Bolivia, where we mountain biked down the death road. Aptly the end of the world was along the death road, so at least that made sense. In Bolivia the end of the world was a particular hairpin turn on the death road. I can’t remember now if it was responsible for the most number of accidents or if it just looked like it should have been the responsible party. Either way our group clustered near the edge of the world for this photo, unwilling to move any closer to what was at least a 100 foot drop into the valley below. last minute holidays in Bolivia. Don’t forget to check out our Country Guide to Bolivia. And Noah had his flood…. Moving South from Santiago, we arrived in the Chilean lake district and made ourselves comfortable in the small town of Pucon. Coming here because we´d heard of a day trek up a snow covered volcano, we figured this was a good place to start our journey into Patagonia. Unfortunately, the volcano was not meant to be. For what wasn’t the first and surely won’t be the last, the weather wasn’t going to cooperate with us. When we arrived in town we were told that it would be at least 3 days until we could go and do the volcano on account of the weather. And by weather they meant “rain”, heavy, continuous rain. With our chances of hiking the volcano slipping away with every subsequent rain drop, we made the best of the town and headed out to do some mountain biking. A day of mountain biking on some rather nice, well tuned bikes…the first time we´ve had that combination on this trip, and we were back to our usual selves. Despite getting caught in the rain, biking through the hills on the gravel roads was a real treat after so long on a bus. 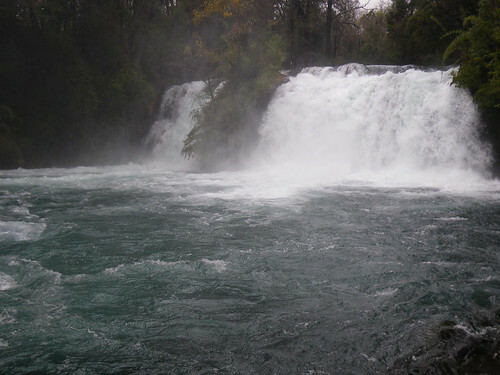 We did a 35km loop around the surrounding country, including a set of waterfalls called Ojos de Aguas. Usually small waterfalls, the turbulent and swift moving water was anything but reassuring for our next activity, some whitewater kayaking. I know what you’re thinking. 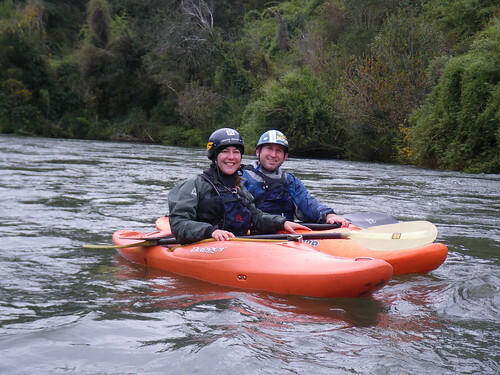 Usually when we write a whitewater kayaking post it details a story that makes our mothers cringe. Have no fear mom, this story has a very happy ending. Not since my terrible time in Ecuador several months ago have I been back in a boat. Those memories were still quite ummm.. prominent as were Jill´s of her rough times in Mexico. The warning from the outfitter…”we´ve had a lot of rain so the river is quite high” had us nervous, but she assured us the river was still Class III which was important to us as we were looking to regain some lost confidence. We regained some confidence alright, but the river was not at Class III. The recent rains had put the river into flood stage. We spent the first half of the two hour trip floating down fast moving, flat water…just taking the time to adjust to the boats and get comfortable. As we approached the first of the rapids though, it was clear that this was not going to be the easy day we were expecting. I’m not actually sure if it was a stroke of luck or actual improvement of our skills, but we took it for what it was…a successful day on the river. Only three months old, Prodownhill has certainly made a name for itself on the South American travelers circuit. Prodownhill came so highly recommended for the death road by several backpackers on their way north through Peru, we didn’t even consider booking the death road with another agency. Suiting our group of 7 up for the day, the equipment was in excellent shape and clearly taken care of. From the protective moto-cross quality clothing, to the top-quality helmets and pads, it was clear Prodownhill had our safety in mind. Decked out in flash gear, our bikes were tuned and ready to go without a lot of fiddling around. Our guides were friendly and did a great job of keeping us together as a group while allowing people to go down the death road at their own speeds. Stopping the group every 10-15 minutes for a safety stop, our guides were constantly telling us about the next section of road and checking to make sure everyone was having a good time. The seven in our group ranged from an ironman competitor to someone who had never used a mountain biked before and I can say with 100% certainty that everyone felt safe and had a great time on the trip. Taking lots of video and photos, which they gave us at the end on a CD, the entire Prodownhill staff was attentive, fun and professional. The bikes were in good condition and the protective gear they provided was so significantly more than any other tour operator we saw that we were almost embarrassed knowing that some of those people had paid almost double, for the same death road, what we did! Our experience with them was so incredible I would actually say the death road has been one of my favorite days in all of South America. Nobody was killed or otherwise dismembered, deformed, or injured in any way. We were the sexiest group of bikers out there, everyone else was jealous. Prodownhill gave us so much food throughout the day that I never got hungry. The brakes on all of the bikes worked. Prodownhill kept the office open late and burned the DVD for us that evening. We paid way less for the death road than probably everyone else out there. I didn’t have to think or worry about anything. Prodownhill helped us find a bus for later that evening. I wasn’t able to buy a cool jersey, instead I was given a free t-shirt and DVD of all our photos and videos. I only had one free beer to go with my free lunch. Prodownhill had a movie for us to watch on the 3 hour ride back to La Paz. On the bike I could go as fast or as slow as I wanted, totally up to me. Scared to death I pulled on my breaks praying I wouldn’t go over the edge. Sometimes activities live up to their reputations. 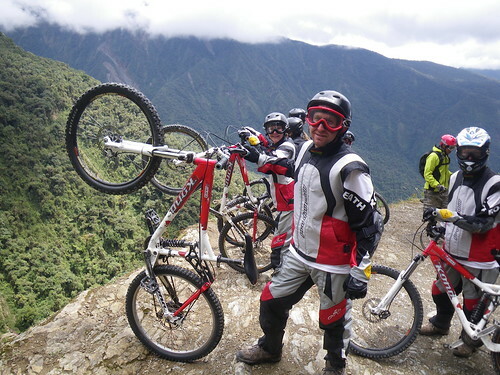 Billed as the “death road”, the world-famous La Paz to Coroico mountain bike ride is a spectacular and thrilling downhill ride on a dangerous, old, gravel road. 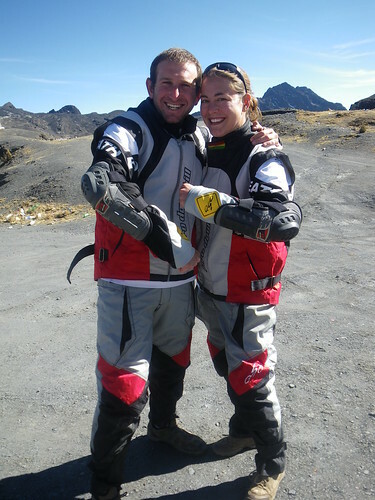 Popular on the backpacker circuit, we had heard about the ride as far away as Nicaragua and were practically salivating to get to Bolivia for it. Suiting up in moto-cross gear, we felt invincible, especially when we saw that the other tour groups were only in reflective vests. I’m not going to lie, the gear was cool. We zipped down the asphalt, where riders have been clocked at over 80 km/h, hugging the curves and pedaling hard on the straight aways. Loving the adrenaline rush of the speed, I was still a little nervous and pretty liberal on the brake. I have no idea how fast I was actually going, but trust me, I was on the verge of out of control. With so many riders out on the road I expected to see many more crashes. After all, its not called death road for nothing. Twice along the road we saw memorial plaques to riders involved in fatal accidents, one only a few years ago. Fortunately or unfortunately, whatever your opinion may be, I saw only one person skid out the entire 5 hour ride, and he jumped right back up and onto his bike. Nothing like last year’s tour de france crash. The gravel section was incredible. Only about one lane wide, the old gravel road was in terrible shape. Besides the steep downhill grade, the road was marked with potholes and big rocks. Vibrating and shaking because of the rocky surface, we navigated the serpentine turns white knuckled. Literally riding on the edge, it was the perfect balance of fear and excitement. I loved every minute of it. The stories we had heard and the scars we had seen seem to be urban legends for the road, while not exactly the safest, was certainly not a death sentence. In fact, it seems that most of the people who crash or go over the side are experienced mountain bikers trying to do tricks, while the rest of the people are just trying to make it down in one piece.